At first blush, it would seem an unusual decision to close out a relatively mellow alternative music festival with an evening of uncompromising death metal, but amidst a weekend characterized by off-kilter programming successes, Sunday night's (September 3) metal shows at FME continued that lineage with an exceptional performance from rampaging San Diego grindcore group Cattle Decapitation. Vocalist Travis Ryan was a study in vocal strength and versatility. Perhaps most remarkable about Ryan is that he can maneuver between the most physically demanding vocal styles without seeming strained. To deliver both cavernous, bottomless roars and sustained, glass-shattering shrieks with warbling vibrato is truly a remarkable employ of vocal muscles, and Ryan seemed intent on exploring every possible extremity. That utter mastery of form extended to his bandmates. Josh Elmore's guitar work was blistering in a most literal sense; it's hard to imagine covering the span of the fretboard so fluidly without having developed knotted calluses on each finger. Bassist Olivier Pinard, having joined the band this year, is a relative newcomer who performs with the calculated, confident poise of a veteran member. Drummer Dave McGraw was, if one were pressed to choose, the true MVP of this crew: his frantic double kicks never strayed from perfectly on beat, nor did his maddened, furious snare snaps or breakable crashes. 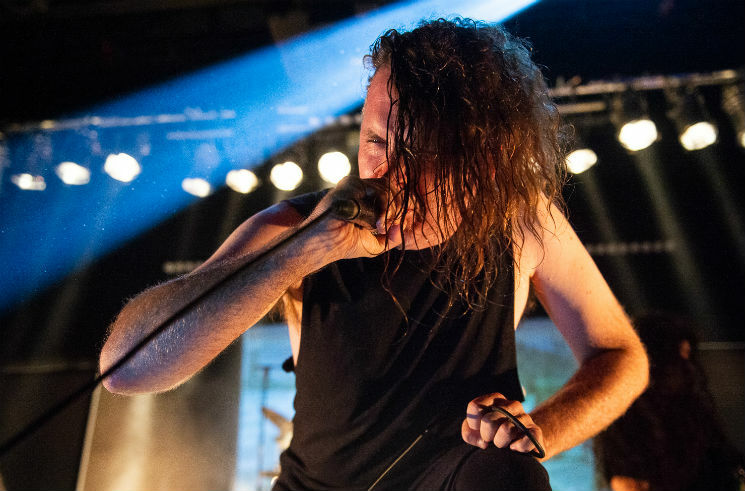 Cattle Decapitation's set was violent, cacophonous, and rarely melodic, but such is the territory, and given the combined technicalities in the mix, it was impressive how clear and integral they sounded in La Petit Théâtre. It should be noted that almost every performance at FME was characterized by sonic excellence, and Cattle Decapitation's uncompromising, bordering-on-obscene sonic aesthetic was, somehow, a fitting end to a festival that celebrated artistry in all its forms.